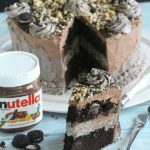 Oreo Nutella Cake is full of chocolate chips, roasted hazelnuts, Oreo buttercream and Nutella. 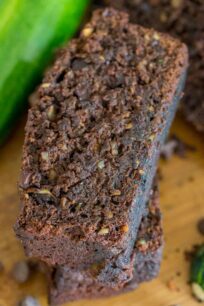 It is moist, flavorful, and indulging, making it the perfect cake for any spacial occasions. We love Oreo desserts that are rich and flavorful, such as Instant Pot Oreo Cheesecake, Oreo Devil’s Food Cake Truffles and Mint Chocolate Chip Oreo Cupcakes. The base for this cake is an egg-free chocolate cake. You know, sometimes egg less cakes can be on the dry side, but not this one. This Eggless Oreo Nutella Cake is moist, dense and very chocolaty. The secret ingredient is silken tofu, yes, tofu! You can’t taste it at all, you would never know that it was added to the batter, but it makes a huge difference in texture. It keeps the cake soft, tender and moist. I also added chocolate chips to the batter, to make the cake even more scrumptious. A little extra chocolate doesn’t hurt, right? I like how the chocolate chips add a slightly chewy texture to each bite. So perfect and sweet! An Oreo buttercream thick layer is stuffed between two eggless chocolate cakes, resembling a giant Oreo cookie in a cake form. The Oreo buttercream is nothing but amazing, I actually added 30 crushed Oreos to it, imagine how good it tastes. To make the cake even more awesome, I covered it in Nutella buttercream. 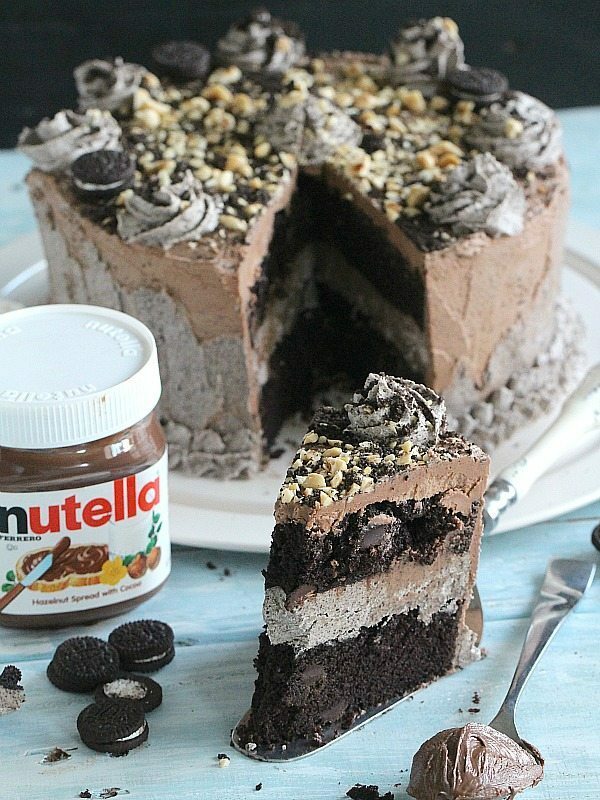 I have combined my love for Oreos and Nutella in one single cake. For the perfect finish I have topped my Oreo Nutella Cake with chopped roasted hazelnuts, for a little crunch, and also crushed Oreo cookies. 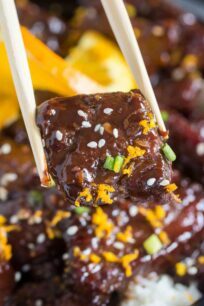 Using high quality chocolate in this recipe is key, as the chocolate flavor is front and center. Make sure the ingredients are at room temperature before you start baking. Also, the oven should be pre-heated. Make sure the cake is fully cooled before frosting it. If the frosting is too thin, add more powdered sugar 1/4 cup at a time. 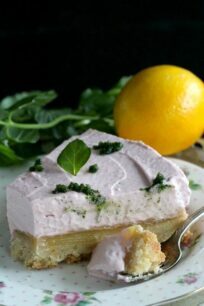 The firmness of the buttercream frosting depends on the amount of sugar to liquid ratio. If you want a firmer frosting, add more confectioner’s sugar. If you want a softer frosting, add more milk or cream. Just do it gradually. What do you need to make Oreo Buttercream? How do you make Oreo Cream filling? Dissolve unflavored gelatin in cold water. Set in heat proof cup in pan; Simmer until clear. Cream together shortening, powdered sugar, and vanilla. Put a spoonful onto one cookie top with another cookie then press cookies gently together. Buttercream also know as butter icing is a type of icing or filling used inside cakes and cupcakes, as a coating, and as decoration. It is very easy to make, by creaming butter with powdered sugar, although other fats can be used, such as margarine or lard. There are no eggs in Oreo. However, Oreo have milk as cross contact and therefore they are not suitable for vegans. Oreo products do not contain nut or nut traces. Wrap each cake layer in plastic wrap, preferably freezer wrap. After that wrap tightly in aluminum foil and place in a freezer ziplock bag (if it fits). Write the date and cake type on the ziplock bag. CAN YOU FREEZE AN ALREADY FROSTED CAKE? Yes, you can, but note, that once you start thawing the cake, sometimes you will get condensation on the cake, that happens when you are trying to speed up the thawing process. Make sure the cake is refrigerated, so the cream won’t spread when you try to wrap the cake in plastic wrap. Wrap the cake (if it fits in your freezer) or individual cake slices in plastic wrap, preferably freezer wrap. After that wrap tightly in aluminum foil and place in a freezer ziplock bag (if it fits). Place cake in the freezer. Cakes can be frozen for up to 3 months. HOW TO THAW A FROZEN CAKE? Remove cake layers or cake them from the freezer the night before you want to use the cake layers or eat the cake. Refrigerate without unwrapping for 24 hours. This way the cake will thaw slowly and without any condensation forming on the surface. After 24 hours, take them out of the fridge and let the cake layers or cake come to room temperature while still wrapped. Oreo Nutella Cake is an egg less cake, full of chocolate chips, roasted hazelnuts, Oreo buttercream and Nutella. 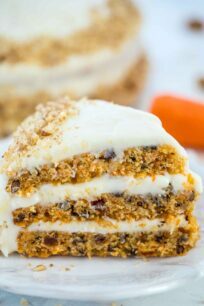 It is moist, flavorful, and indulging, making it the perfect cake for any spacial occasions. Grease and flour two 9-inch cake pans, lay parchment paper on the bottom and grease again. In a large bowl, or in the bowl of an electric mixer, combine flour, salt, baking powder, baking soda, cocoa and sugar. Add canola oil, followed by the hot coffee and mix on low-medium speed. Add heavy whipping cream, tofu and vanilla, and mix until combined. Using a spatula stir in the chocolate chips. Pour the batter evenly into both 9-inch cake pans and bake for 25 to 35 minutes, until a wooden tooth pick inserted into the center of the cake comes out clean. Switched the pans around 12-15 minutes of baking, from the middle shelf to the bottom and the bottom shelf pan to the top, to ensure even baking. Remove cakes from oven and let cool completely before removing from pans. Once cooled, transfer to a wire rack. The cakes should cool completely on the wire rack before frosting. In the bowl of an electric mixer, fitted with the wire attachment, beat together butter until smooth. Slowly add 4 cups of powdered sugar and mix until smooth. Pause to scrape the sides of the bowl. Add vanilla extract, Oreo crumbs and remaining sugar, mix until smooth. Add milk until you get a smooth, desired consistency. 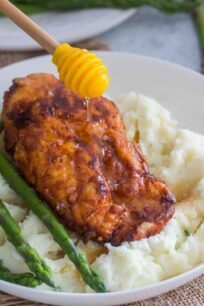 Use immediately or cover and refrigerate up to three days. To use once refrigerated, slowly allow reaching room temperature and then beat on low speed until the buttercream is smooth before using. Cream together butter and 1 ½ cup of confectioner’s sugar, once combined add Nutella and whisk until combined. Add vanilla, pinch of salt and the rest of sugar, mix until smooth, pausing to scrape the sides of the bowl. Beat on high for about 20 seconds to lighten the frosting. Add heavy cream, one tablespoon at a time until the buttercream has reached a consistency where it holds its shape. Whip on high for a final 20 seconds. 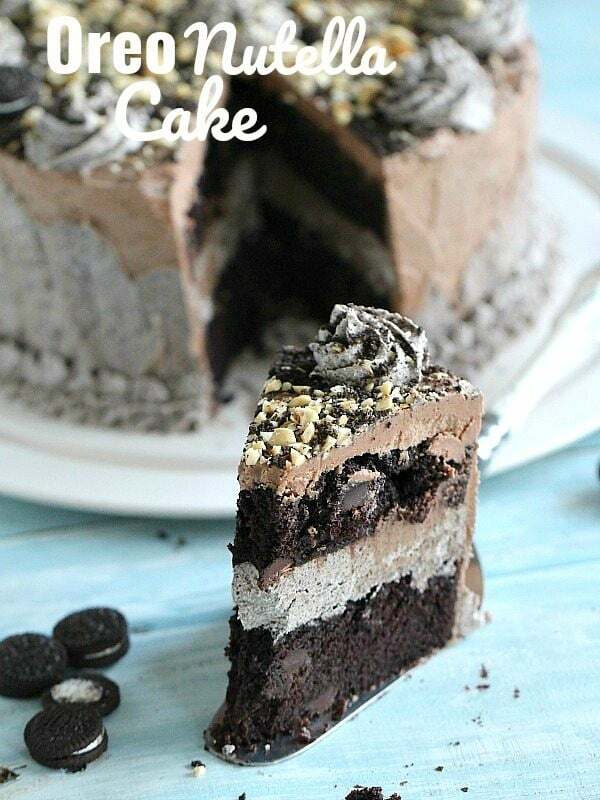 Place first layer of cake on a cake plate and cover with a very thick layer of Oreo buttercream. 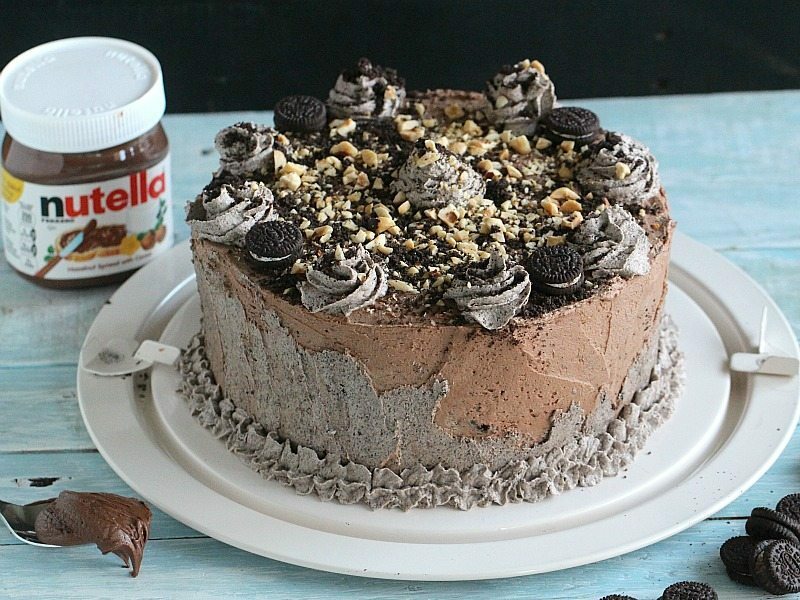 Add second layer of cake and cover it with a thick layer of Nutella buttercream, ice the outside of the cake with a combination of Nutella and Oreo Buttercream. Finish cake off with chopped roasted hazelnuts, mini Oreos and Oreo crumbs. Oh wow this just looks divine! 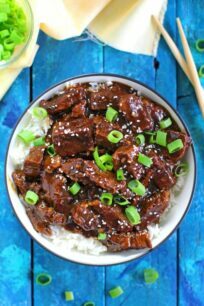 Love how you used tofu instead of Eggs! 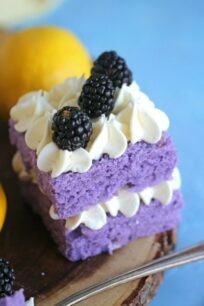 This cake looks sinfully delicious! Omg, look at that thick layer of oreo buttercream!! And then topped with nutella buttercream. I NEED this in my life! Seriously, I can barely get past looking at these photos all day! This is one of the most gorgeous things! And the Nutella and hazelnuts, and Oreos?! And…tofu?! Awesome! Oh my goodness, this looks sinfully delicious! Stunning! I’m not even embarrassed to admit that I am basically drooling over here! Nothing beats Nutella or Oreo’s unless you put them together of course! Love this! I could watch Scnlhdier’s List and still be happy after reading this. Now this looks like a dessert that I would have a hard time sharing! 🙂 Thanks for sharing! That looks amazing! I’m all about chocolate overload. Turned out gorgeous! I don’t know if I have ever had an eggless cake before. If they are anything like this AMAZING cake then I am all in!!! There is nothing dry about this cake for sure. If I could marry Nutella, I would! And then I’d eat it every day. Probably not the best idea! But a slice of this cake would me nice. It looks phenomenal! This cake looks amazing!!!! Wow! Hello i made this last week for my son’s 2nd birthday my family loved it. 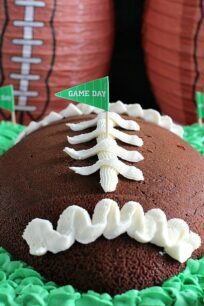 Tomorrow its his birthday party, and i want to double the ingredients. i used a 9″ round pan and two separate layers. But if I double the recipe will the layers hold same consistency due to thickness? Thank you. Your response is really appreciated. Hi – I am very happy that everyone loved the cake, its definitely a hit with my friends and family as well. I am sorry, I just saw your comment, I was traveling, the recipe will work fine, just need to increase the baking time. Hello! Could you please help me out – if I want to make this cake with eggs, how many should I use? Hello! My comment was deleted by some reason..
Could you please recommend how many eggs should I use instead of tofu? Hi!!! Ur cake looks super delicious n sinful…. 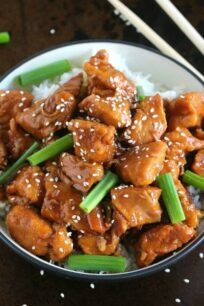 i would like to knw if its ok to replace tofu with yogurt? N do u think this filling is safe for a 2 tier cake? Awaitin ur reply… thanks!! Great going!! yogurt is an egg replacer that I always use & works just fine.. I never tried it in this cake, but let me know how it works.